hardcover book (978-0-9649585-5-5) still available. A comprehensive history of the elite troops of the Confederacy, as well as an essential reference for historians, enthusiasts, and reenactors. "A most welcome and long overdue study of a neglected subject." - Jeffry Wert, author of The Sword Of Lincoln: The Army of the Potomac. "Tells The story of the Army of Northern Virginia's sharpshooter battalions here for the first time." - Robert K. Krick, author of The Smoothbore Volley that Doomed the Confederacy. "Provides our first and most detailed to date look at the development of the concept and practice of Civil War sharpshooting." - William C. Davis, author of Look Away! : A History of the Confederate States of America. I am now blogging on the TOCWOC Civil War blog. The term sharpshooter had a more general meaning in the mid-19th Century than it does now. It could mean either a roving precision shooter like the modern sniper (a term that did not come into use until late in the century) or a light infantryman who specialized in the petite guerre: scouting, picketing, and skirmishing. The modern sharpshooter appeared in Central Europe around 1700 (the term comes from the German scharfschutzen), so the book begins with a look at how European armies employed both light infantry and sharpshooters through the Napoleonic Wars and the Mexican War in America to the “Minié revolution” in firearms just prior to the Civil War. At the beginning of the American Civil War, thanks to Hiram Berdan, the Army of the Potomac had a definite advantage in sharpshooting and light infantry, and this came as a rude shock to the Confederates during the 1862 Peninsular campaign. In response the Confederates organized their own sharpshooters, beginning with those of an obscure Alabama colonel, Bristor Gayle. Confederate general Robert Rodes organized the first battalion of sharpshooters in his brigade in early 1863, and later in each brigade of his division. In early 1864 General Lee adopted the concept for the entire Army of Northern Virginia, mandating that each infantry brigade field a sharpshooter battalion. These units found ready employment in the Overland campaign, and later in the trenches of Petersburg and in the fast-moving Shenandoah campaign of 1864. Although little has been written about them (the last book, written by a former sharpshooter, appeared in 1899), they played an important and sometimes pivotal role in many battles and campaigns in 1864 and 1865. By the end of the war the sharpshooters were experimenting with tactics that would become standard practice fifty years later. Although most people think of Berdan’s Sharpshooters when the subject comes up, the Confederate sharpshooter battalions had a far greater effect on the outcome of the conflict. Later in the war, in response to the Confederate dominance of the skirmish line, the Federals began to organize their own sharpshooter units at division level, though they never adopted an army-wide system. After the Civil War, the book follows the further evolution of rifle technology and the “open order” tactics during the Boer War, and then looks at the role and organization of the German stosstruppen in WWI, which was surprisingly similar to the Confederate sharpshooters. The book concludes with an analysis of the part the sharpshooters played in the Civil War and compares them to other historical light infantry formations. 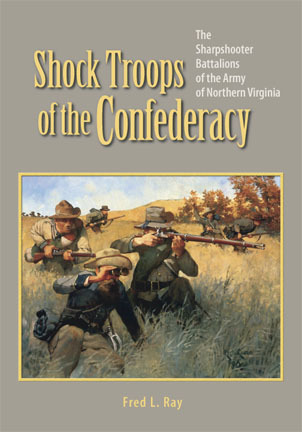 Overall, Shock Troops of the Confederacy deals with three themes: the organization and employment of the Army of Northern Virginia’s sharpshooter battalions; the history of light infantry from 1700 to 1918; and the human story of the sharpshooters themselveson the picket line, in the trenches, and in the field.